I'm reading this article from raywenderlich blog: http://www.raywenderlich.com/23037/how-to-use-instruments-in-xcode to learn about instruments and figure out if I´m doing something wrong in some old projects. I've seen that in one particular point of my code, when I'm showing a modal view that eventually is closed, the memory allocated remains there. As you can see in the following image. The execution have 4 marks generated. Between the 2n and the 3t mark, the view is showed, as you can see, new memory is allocated. 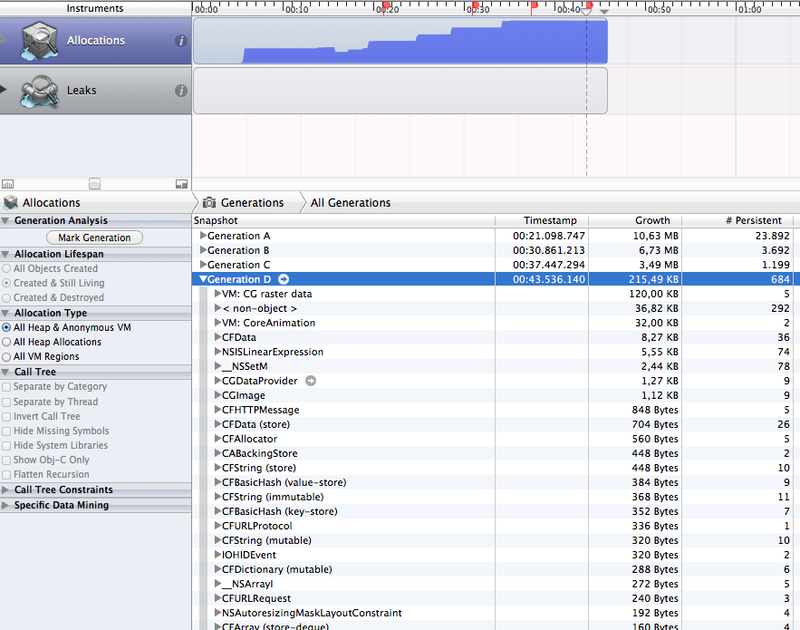 But between the 3t and the 4th, I've called dismissViewController, and the view no longer remains. But the memory remains allocated. So, do you have any idea about what's happening? From what I know, even the properties are declared as strong, when the UIViewController is released, all of them are going to be released to. Thanks to all, with the information I provided, wasn't enough. 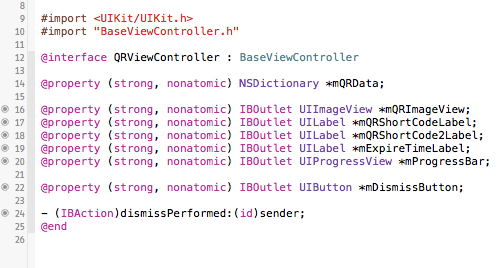 As you can see, QRViewController inherits from BaseViewController. This controller had a delegate defined as strong storage, terrible. In the view controller hierarchy, self.view holds ALL his subviews with strong, so everything under self.view (Probably all your IBOutlet properties) can switch to weak. That probably won't solve the problem though. It's difficult to pinpoint precisely the problem, but usually when things like this happen to me, it winds up being one (or a few) "root" culprits -- you find that one, clear it up, and then lots of others clear up too. So one strategy you can try is to sift through the Instruments data looking for any sort of "hierarchy" (think about how your app is structured and how the objects relate to each other) and look for objects closer to the base, then cross-reference against your code to see if they might have a retain cycle or some other such issue. One immediate change I would make would be to change your IBOutlet declarations from strong to weak. For the most part, IBOutlet properties should be weak, for objects that are within a hierarchy. So if say you've got some UILabel within your xib's main view, that label should be weakly-retained so as to avoid a retain cycle. But if say that UILabel is standing alone as a root item within the xib, then it would need a strong reference. I'm going to guess most (if not all) of your IBOutlets there are within a hierarchy, so make them weak and try again. It may not solve all the leaks, but see if it makes any difference. This is called Abandoned Memory, check this link. The posted link above shows a practical example on how to catch abanodend memory using Xcode Instruments. Not the answer you're looking for? Browse other questions tagged ios objective-c swift memory-management properties or ask your own question. should i release strong properties by myself?